What Is Social Anxiety And How Greatly Can It Affect Your Life? Are you having trouble socializing with people in various events and prefer spending your time all alone? You might think you are just too shy to mingle with other people but you could already be having worse. And because of this, you will not be able to deliver a speech in front of other people or even accommodate a job interview whenever you are planning to get a job. If you are having this kind of problems then you already might be suffering from social anxiety disorder. And in order to effectively deal with this problem and live a normal life, it is best to have a better understanding of the said anxiety disorder. Otherwise known as social phobia, social anxiety disorder is divided into two types – specific and generalized. The first one refers to having difficulty dealing anxiety triggered by situations wherein they will have to speak in front of other people. The latter, on the other hand, is when a person with such disorder is uncomfortable and tense in almost every situation that needs socializing with other people such as at work or in school. Most people with social anxiety disorders think that they only have normal shyness just like other normal people do. But then, these people with such disorders constantly experience intense fear of getting embarrassed in front of other people. As a result, these people are forced to avoid certain situations that are in fact essential for their career and self development. But people with social anxiety don’t have to worry and stay in the dark anymore for present treatments have already been proven in helping people overcome their mental illness and get back on their feet. One popular and effective treatment for people with social anxiety disorder is the so called cognitive behavioural therapy (CBT). The said therapy is a generalized form that is comprised of several specific types of therapy such as Dialectic Behaviour Therapy, Rational Emotive Behaviour Therapy, Rational Behaviour Therapy, and Rational Living Therapy. But person with social anxiety first needs to consult with his doctor in order to determine which specific type of cognitive behavioural therapy is best for him. The patient also needs to be consistent with his therapy in order to achieve the best results. 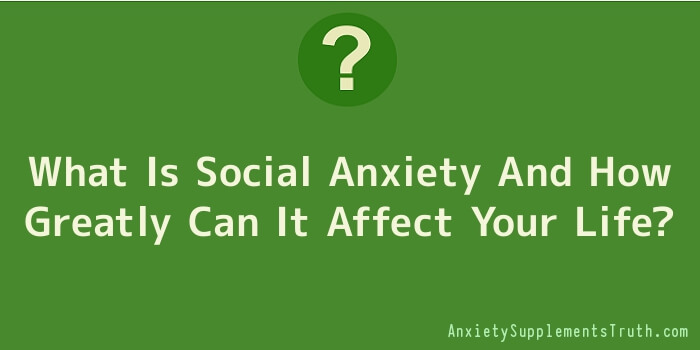 Working hand in hand with your doctor helps you overcome your social anxiety problem in a shorter period of time. Known as social phobia, social anxiety disorder is a chronic form of anxiety which affects a lot of people, and is at the moment the third most encountered anxiety disorder in the United States alone. Described as an illogical fear of being in social environments, social anxiety can certainly keep affected peoples from creating natural relationships; stop them from becoming involved in activities and essentially enjoying a normal living. Due to a persisting anxiety of not fitting in, or humiliating themselves, those that have this problem are usually very anti-social, spending almost all of their time alone, or with only a particular couple of trusted persons. It is quite normal for anyone to be shy sometimes. Shyness is a usual feeling felt by regular, healthy persons of any age, from very little kids, all through maturity. This can be a great emotion to experience, as well; in many ways, shyness works like a little bit of a safeguard to maintain us humble and keep us on our feet in circumstances such as getting positive comments or even being around somebody we are interested in, helping us to build much deeper relationships with others due to this fact. On the other hand, shyness that goes to extremes, making it difficult for somebody do things like create eye contact with another person or easily talk to them, is not really just shyness. If this exaggerated “shyness” develops to attitudes like avoiding social occasions entirely, then it will become social anxiety. In more serious cases, affected individuals may experience the usual signs of anxiety when they are pushed into social situations. There is often speeding of the heart, sweating, stuttering, anxiety, rapid respiration, dizziness and even diarrhoea, as well as other signs and symptoms. This illogical anxiety will cause affected individuals to frequently worry about humiliating themselves by doing or expressing the completely wrong things, or simply just not fitting into a particular group of persons. Activities like eating or drinking openly, talking to groups, going on dates, getting in the centre of attention for no matter what the occasion, needing to use public restrooms and asking questions become just about not possible, eliciting a lot of anxiety symptoms. Even speaking on the phone is a common cause for the people affected by severe social anxiety, with texting and email a much more preferred way of interaction. All of this influences a person’s capacity to maintain an ordinary living and can be combined with some other psychological conditions like depression, low self confidence and others. Treating Social Anxiety Disorder, Anybody whose anxieties of socializing with other people or of social occasions have stopped them from doing things is suffering from social anxiety and should look into remedy for it. People, by our very nature, are at least semi-social creatures; therefore being able to correct this can be very helpful to aid affected people in restoring a normal, productive lifestyle. Social anxiety is detectable in persons – with a greater occurrence in women – from very early on, occasionally as little as only a few years of age; the usual starting point is in early teen hood, however. Most people tolerate the condition for a decade or even more before they are diagnosed and start any kind of treatment and this can be destructive when happening during the teen and young adult years. There is also a high percentage of anxiety sufferers who do not get diagnosed at all and continue to suffer. Therefore, it is necessary for either sufferers themselves or the folks in their surroundings to take the signs and symptoms of social anxiety seriously.